VATICAN CITY (Reuters) - A commission looking into the Vatican bank briefed Pope Francis and top cardinals on its findings on Tuesday ahead of a papal decision about what to do with the institution that has embarrassed the Holy See for decades. The Vatican commission, which the pope set up in June, gave Francis and his eight-member advisory board of cardinals from around the world a three-hour briefing. Afterward, Vatican spokesman Father Federico Lombardi said no decisions on the bank's future had been taken. He said the commission gave the pope and the cardinals an "ample and detailed" report on the current and past situation of the bank, and had offered "several possible indications" on its future. Lombardi would not give any details. 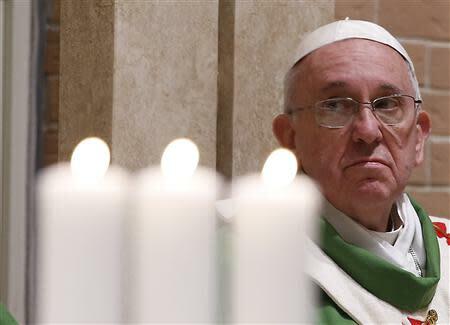 "We are waiting for indications from the pope," Lombardi said. The pope has not ruled out closing the bank altogether if it cannot be reformed and has said he wants the Vatican to adhere to international standards of financial transparency. There have been suggestions that a new ministry may be set up in the Vatican to deal with all of its financial matters, which are now handled by the bank and several other departments. The eight cardinals from Italy, Chile, India, Germany, Democratic Republic of Congo, the United States, Australia and Honduras are advising Francis on how to reform the Curia, the Vatican's often dysfunctional central administration. The bank, formally known as the Institute for Works of Religion (IOR), has been hit by scandal numerous times over the past decades. Italian banks stopped dealing with the Vatican bank in 2010 after the Bank of Italy told them they had to enforce strict anti-money laundering criteria. That year, Rome magistrates investigating possible money laundering froze 23 million euros ($31.15 million) held by the IOR in two Italian banks. The IOR said it had merely been transferring its own funds between accounts in other countries. The money was released but the investigation continues. which serves Catholic institutions, clerics, employees or former employees of Vatican City, and embassies and diplomats accredited to the Holy See. The IOR has been closing accounts held by persons or institutions outside those categories. Last month Moneyval, a monitoring committee of the Council of Europe, gave the Vatican and its financial regulators a mostly positive assessment but urged more controls over the IOR. The IOR was thrust back into the spotlight last month when Monsignor Nunzio Scarano, a former Vatican prelate on trial for an alleged plot to smuggle 20 million euros into Italy was further charged with laundering millions through the bank. The IOR's top two managers resigned in July, several days after Scarano was first arrested. Since then, relations between the Vatican and the Italian magistrates, which has often been thorny in the past, has improved dramatically. Italian investigators have thanked the Vatican for "fully collaborating" on the Scarano case. Pope Francis has a packed week of meetings about reform with top Church officials who are in Rome for ceremonies this Saturday when the pope will create 19 new cardinals from around the world.